Credit here goes to my good friend Katie, who showed me this recipe. She found it while browsing Pinterest, and the link for the original recipe is here. Katie kept raving about these Larabars, so I just had to try making them. Larabars are a brand of fruit and nut bars that use natural ingredients and come in a variety of flavours. I have tried several of them, but not the peanutbutter chocolate chip ones because I am allergic to peanuts. 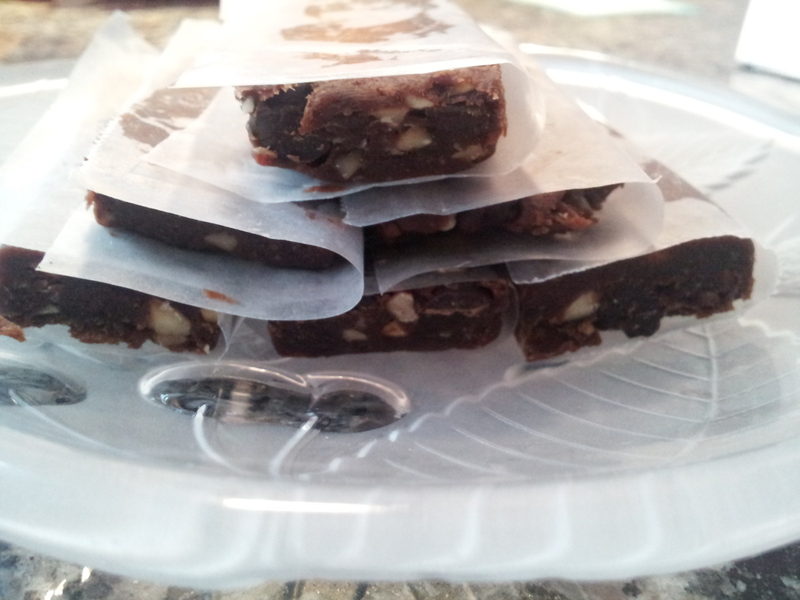 With some modifications, I made a peanut-free version of these Larabars, inspired by Katie and the blog I mentioned above. I put the almonds in a food processor and processed lightly, until the almonds crushed into small pieces. I took them out and put all the other ingredients except the chocolate chips into the food processor and food processed the mixture. (My tiny one-litre food processor couldn’t handle the dough, so when I make them again I will process the dough in smaller batches.) Lastly, I processed the mixture again with the chocolate chips added. I formed the dough into a ball, placed it between two sheets of wax paper (parchment paper works too), and flattened the dough into a 1/2 inch-tall rectangle, using my finger tips (a rolling pin would work too). I refrigerated the dough for about an hour and then cut the dough into bars, around 3 inches by 1 1/2 inches. I wrapped the bars in small pieces of waxed paper and kept them in the fridge until I wanted to eat them. These made an excellent snack for an extra boost of energy. I need all the energy I can get these days to get through my last three weeks of school!